Jesus is God. There are two schools of thoughts on this topic. There are those who believe in the God the Father, God the Son and God the Holy Spirit. They believe in God as Three in One. They are referred to as Trinitarians. Then there is the other school that believes there can never be any other gods but God Himself and Jesus is God becoming man. God is One. But what does the Bible tell us about this? Christ Jesus, the man, was born at Bethlehem. We believe He did not pre-exist as the eternal Son of God. The single greatest difference between what we believe and what Trinitarians believe relates to the pre-existence or non-pre-existence of the Son of God. The Trinitarian doctrine holds that Jesus pre-existed, that is, He lived before Bethlehem, as the eternal Son of God, the second person in the Godhead. But we find no eternally existent Son of God in scripture. Certainly not in what God teaches in the Old Testament. Jesus was not in Old Testament times, nor is he now the second person in the Godhead. Jesus is God, the God of the Bible, who reveal himself to creation as a man. The word Godhead, "theotokos" in Greek, means "the deity." No-one can be in the Godhead. There is nothing in scripture to support this. There is everything in scripture to support the truth that God is one, alone in his category. In Trinitarian thinking, and even in Oneness thinking carried over from Trinitarianism, the word godhead to seem as a corporate term. The Godhead is thought of as being some sort of a panel, board, or composite of persons. We decide to put God and man in the godhead in a certain way. Only God is the Godhead. Nothing can be in the Godhead and only God is Divine. To say that someone or something is in the Godhead is inappropriate and unscriptural. What scripture does express is the fullness of the Godhead in Christ. "All the fullness of the Godhead dwelleth in him bodily". (Colossians 2:9), therefore Jesus is God. Jesus was never and is not now the second person in the Godhead. Hebrews 1:3 tells us Jesus Christ is the express image [NIV states "exact representation] of his [God's] person. God is a person, an individual, an identity, a unique being. Scripture does not support the statement that within God's being are three persons. God is one individual, one person who appeared on earth as Jesus Christ. Hebrews 1:3 speaks of God and man, a visible image of an invisible God. It does not put forth the idea of a plurality of persons in the Godhead, nor does any other scripture. Jesus is God. When Jesus was born, God became a father and Jesus Christ was the Son (Hebrews 1:5). God was never a Father in a procreative sense before Jesus was born. Malachi 2:10 asks, "have we not one Father?" Yes, we have one Father, God who created us. But God was not a Father in a procreative sense until Jesus Christ was born. Hebrews 1:5 clearly shows this, "I will be to him a Father, he shall be to me a Son." There was no father-son relationship before the Lord's conception and birth. And certainly no divine father and a divine son as eternal persons. The Bible emphatically declares I will be to him a father, he shall be to me a son, a prediction of a reciprocally exclusive relationship. Christ had two identities, two capacities. Jesus is God and man. He could act as God. He could act in the capacity as man. He could speak as God and he could speak as man. As a man he said, "I thirst." As God he could say to the blind man or to the leper, "I will, be thou clean," without any reverence to being deity. In him were two genders, divine and human. Gender, as used here, does not refer to sexual differences but to differences of class or category of being. He occupied two classes, the only one whoever did. Jesus is God and man, God manifest in flesh (1 Timothy 3:16). Jesus was simultaneously both father and son, God and man. Thomas said "My Lord and my God" (John 20:28). My Lord, the exalted man, Lord and master of the church. My God, the creator of the universe. Jesus said, "I and my Father are one" (John 10:30). Jesus was the man in whom God was embodied with a will, a personality, a mind, a heart with which to love. The disciples knew him as a man, they did not know him as God. They knew the way he looked at them, the way he smiled, the way he talked, the aspects of his personality. And yet the disciples knew much of what God was like from Jesus because he was the visible image of the invisible God as he subjected himself in all to the Spirit of God. He behaved as God would behave. He said, "Lo I come in the volume of the book it is written of me to do thy will O God" (Psalm 40:7, Hebrews 10:7). 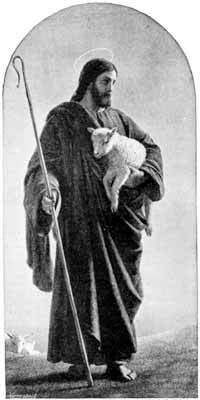 The man Christ behaved as God because Jesus the man yielded his will, the will of the flesh, to the scripturally expressed will of the Spirit of God, saying, "Not my will, but thine be done" (Luke 22:42). 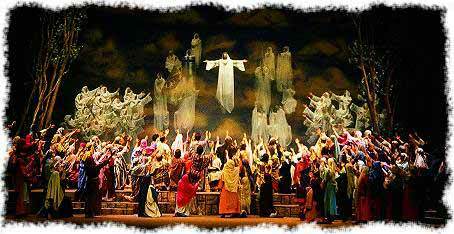 Jesus personified the Spirit of God here on this earth in all. Jesus was not simply a carcass or a robe. He was a man, wilfully yielding to the Spirit of God. The man was like other men in all ways except sinfulness. He prayed; he obeyed; he was subject in all to God. He could not, and did not, use his divinity for his own benefit. When Satan said, "Command these stones that they be made bread," Jesus refused. He accepted human suffering, suffering even the death of the cross (Philippians 2:6-11). The Father to Son, God to man, manner of speaking and relationship, is a temporary relationship for redeeming mankind without human encroachment on divine privileges. The relationship began when the Lord was conceived, begotten. "I will be to him a Father, he shall be to me a Son." It will end when the mediatory role of Sonship is completed. When every soul has had every opportunity to receive every benefit God made available to mankind as Jesus. Jesus will "Show us plainly of the Father" (John 16:25, 26). He will reveal himself as "God, all and in all". Jesus is God. Glory to Him. (1 Corinthians 15:28). We will learn that our brother (Hebrews 2:10, 17) is also our Father (Revelation 21:1-7, 22:13-16). He will always keep the identity of Jesus Christ, our Creator who became one of us to redeem us, but the fact will always remain that Jesus is God.